Imagine leaving home to study in another country in a language that is not your native tongue. What thoughts would be going through your head? 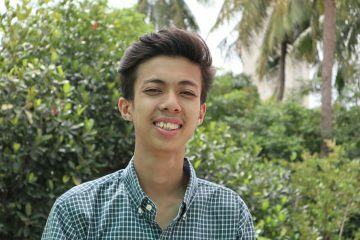 For Pagna, a 19-year-old scholarship student from EYC, any trepidation he might feel fades in comparison to the prospect of meeting new people, being exposed to a different educational system, and broadening his understanding and knowledge of the world. All that being said, he admits to being a little nervous about the weather! Following in the footsteps of Synoeun an EYC alumni and our current Program Director, Pagna was recently accepted into an exchange program at Bridgewater State University (BSU) in Massachusetts where he will study International Relations/Political Science. He will embark on this once in a lifetime opportunity when he heads to the US at the end of August. Pagna has been a part of the EYC family since 2011 when he first started taking English classes at Aziza. Like the majority of our students, he has experienced loss and hardship throughout his young life, including his mother’s passing when he was two years old and the demolition of his home at the White Building when he was 18. Yet, through it all, Pagna has utilized his curiosity and positive attitude to forge ahead. 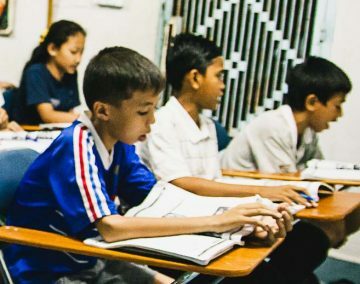 Over the years, Pagna has taken advantage of the classes at EYC to improve his English language abilities and computer skills resulting in a scholarship from EYC. In turn, he has given back to EYC by working as a computer tutor, soccer coach, and a community volunteer helping to organize a clean-up at the White Building among other activities. The scholarship Pagna received from EYC covered additional classes he needed to prepare for the national exam required for university entrance. After passing the national exam last year, Pagna enrolled this year in his foundation year at Pannasastra University where he is studying International Relations. Pagna is very committed to the EYC community, having found a family of friends amongst the other students and teachers. In addition to the relationships he has formed, he credits EYC with opening up his world helping him to think more deeply and better understand his potential. “To me, continuing my education in an American University is very significant because I will be able to enlarge my worldview by understanding another culture, and experiencing the American way of life, while of course, improving my English skills. On a personal level, I will also surely become more independent and more confident in life as well as in my studies. Academically, I am passionate about the subjects related to Political Science and keen to learn those that are relevant with my major, such as education and government, American government. I also wish to learn and improve specific soft skills in the areas of critical thinking, effective communication, creative problem solving and civic engagement: Such practical skills, in addition to political science subjects, will enable me to apply for jobs in Cambodia that would fulfill my desire to contribute to the development of the country. While Pagna is only at the start of his adventure at BSU, he is already thinking about how he can use his experience to inspire other EYC students. Pagna says, “This opportunity is like a diamond. Not everyone gets a chance like this.” He is grateful and proud to have been accepted into this program, and as he did with EYC, he will make the most of this opportunity.